The first of our Catwalk to Copenhagen images from Paris Couture Week, Fall 2011: Armani Privé. The pair of photos above is are our translation of runway couture to street style. Having been at the Cycle Chic and Copenhagenize headquarters for six months now, the Cycle Chic concept and the photographs are engrained in my memory. 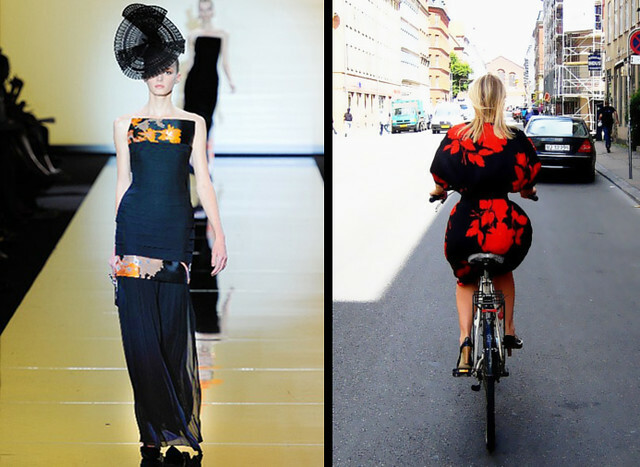 Nearly every runway photo I see provokes a Cycle Chic photo, so this sneak peak post and the posts to come tomorrow feature the runway shot on the left and the street style shot it brought to mind on the right. This is some twist, not just a conventional fashion show. Loving that black and red print dress - it looks almost like a kimono from the back! This post is a lot of fun for us, so thank you for all your messages!